My vegetables are in the witness protection program. I fully admit that I will hide, disguise, camouflage, conceal, veil, cloak, bury, and otherwise transform vegetables into recipes that I can get myself my kids to eat. So when son #2 came home and said he loved pumpkin spice bread, I seized the opportunity to get some beta-carotene seamlessly into his diet in the form of a mock Starbuck’s baked good. 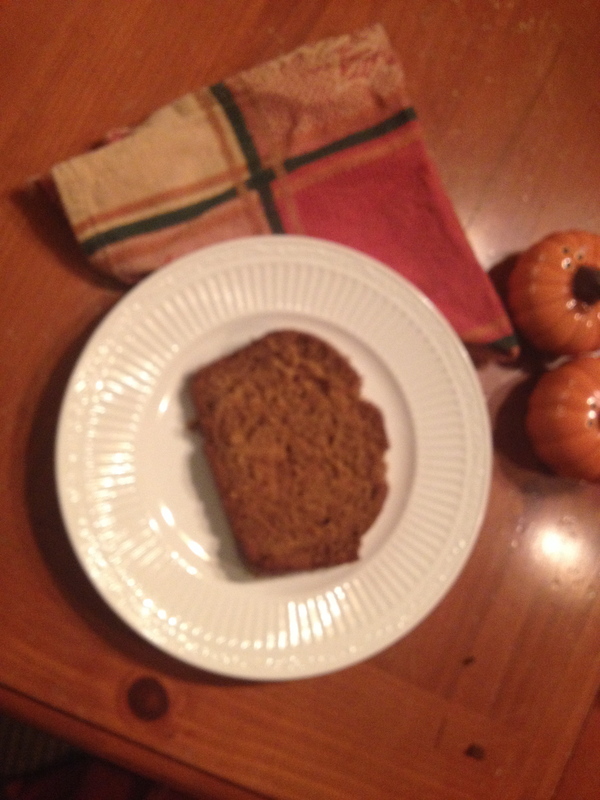 There’s a million pumpkin bread recipes out there, but this one I’ve adapted to make two loaves and enroll some Greek yogurt in the calcium protection program as well. Alias: Trick your kid into eating something good. 1.) Preheat the oven to 350 and spray 2 loaf pans with nonstick cooking spray. 2.) Mix first 7 ingredients together just until blended well in a large bowl or stand mixer. 3.) Mix together dry ingredients together in a separate bowl; add slowly to batter, only mixing until combined. 4.) Bake in a 350° for one hour until firm in the center. 5.) Assume new identity–change names on passports and social security cards.